We love superheros of course. Everyone of have fantasized about, crazed about and loved them at various stage of life. We all look for a savior who have the ultimate powers and overpower the evil growing all over our surroundings. We believe that the Good has to won the Bad. But, in real life we see the stuff otherwise, which makes us thinking that having superpower solves the problem. The humankind had fantasize a number of superheros. Of course, the gods are also superheros for all of us. Hanuman is loved and believed by almost all Indian kid to be a superhero who can come to rescue from ghosts, bad spirits and bad times. The Indian TV screen have seen a number of superheroes and of the them, very original from India and belong to the modern generation, is definitely “Shaktimaan”. The literal translation of the word is “The Powerful”. 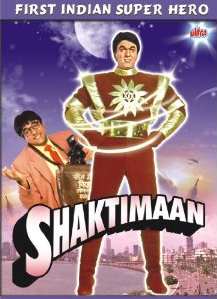 After the splendid performance as Bheeshm in The Mahabharat TV Serial By B. R. Chopra; which earn commercial and critical acclaim for Mukesh Khanna made him establish a production house named Bheeshm International and produced a TV serial called Shaktimaan where he himself played the title role and was warmly welcomed by the people. One nice thing we love about this TV Serial is, it always gave nice message to the kids, never promoted vulgarity (some superhero movies of current days are on the contrary tries being hit on the vulgar dialogs and some stuff which is definitely not good for the kids). The serial also used to display the messages that the stunts are done by well trained and experienced stuntmen under all the safety precautions. It also used to show the children that some of the scenes are done using special effects, and no human can do it. So children (or to the matter of fact, no one) have not to try doing so, which can result into fatal accidents, and definitely dangerous for them! In the world, when every other fellow in the business is running after money, you need a lot of guts to promote this facts, and guide the people rightly! Though the serial is inspired a lot by Superman – the famous Comics, TV ad Film series (and a lot of other sources, which we may refer in the course); it has its Indian roots. Our mother earth is one of the very small segments of the entire universe. Around 10000 years ago there was the kingdom of light on the earth. The vedic chants, hymns and Yogic powers have made the earth a pious place during the times. All the creatures were living in peace. Around 6000 years from now, the Kaliyug (the era or age, as per the Hindu Mythology, a Yug is a large segment of time – precisely there are 4 Yugs or ages, Satyug or Satyayug, DwaparYug, TretaYug and Kaliyug – all are having its own attributes ; by this calculation it is the first segment of Kaliyug is running as of now, that is why in all the Vedic rituals in India, the Brahmin/priest when initiates a task via Sankalp – refers, “Kali Prathamcharane, BharatVarshe”) is started. The attributes of Kaliyug (or KaliYuga) shows its effects as the thoughts are corrupted, the people started loosing humanity, they are moving away from morals and ethics, tons of scams, conspiracies and other stuff comes our way on the regular bases, which leads to war, and at a certain stage, may be demolition of everything will take place!!! We do not care more for the nature, environment and other precious gifts of the destiny to us which came our way for free, anymore. The spicies are getting lost, global warming is leading us to the ice ages and other circumstances makes us think that this is definitely not the way of progress! The kingdom of light is being taken over by the kingdom of darkness and leading towards the dark times. The Earth gives the stability, existence, support and ability to tolerate. Be ethical, tolerant and genuine like it. The air is the life, the breath, the voice (outer and inner), its powers makes one to travel at very very high speed in addition to make the hearing power and breathing expertise, extra ordinary. The fire is the source of energy and it is much powerful, it is pious, it is the anger, it is the enemy too, no one can remain improper once passed through it. The Water is the life, it is immortal, it is soft, be life saver like it. The sky is expanding beyond the imagination, it leads to infinity like the knowledge, it is zero yet the reason for existence of the universe, be unbound like it. And based on this transformation and power implant, a complete yogi and a complete warrior came to existence, he is guided towards his KarmBhoomi and named as Shaktimaan.